Mayweed Chamomile (Anthemis cotula) is a dicot weed in the Asteraceae family. In Washington this weed first evolved resistance to Group B/2 herbicides in 2010 and infests Spring Barley, and Wheat. Group B/2 herbicides are known as ALS inhibitors (Inhibition of acetolactate synthase ALS (acetohydroxyacid synthase AHAS)). Research has shown that these particular biotypes are resistant to cloransulam-methyl, imazethapyr, thifensulfuron-methyl, and tribenuron-methyl and they may be cross-resistant to other Group B/2 herbicides. Mayweed chamomile seeds were collected from six different fields across the Pacific Northwest. All populations (each collection site was considered a population) were suspected to have some level of acetolactate synthase (ALS) resistance. Greenhouse and laboratory studies were conducted to determine if these populations were resistant to three different classes of ALS inhibitors: sulfonylureas (SU), imidazolinones (IMI), and triazolopyrimidines (TP). A whole-plant dose–response and in vitro ALS activity studies confirmed cross-resistance to thifensulfuron + tribenuron/chlorsulfuron (SU), imazethapyr (IMI), and cloransulam (TP); however, resistance varied by herbicide class and population. 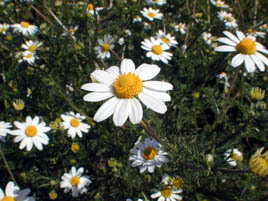 Two ALS isoforms of the ALS gene (ALS1 and ALS2) were identified in mayweed chamomile; however, only mutations in ALS1 were responsible for resistance. No mutations were found in ALS2. Sequence analysis of the partial ALS gene identified four point mutations at position 197 (Pro197 to Leu, Gln, Thr, or Ser) in the resistant populations. This study demonstrates genotypic variation associated with cross-resistance to ALS inhibitors within and between populations. Greenhouse, and Laboratory trials comparing a known susceptible Mayweed Chamomile biotype with this Mayweed Chamomile biotype have been used to confirm resistance. For further information on the tests conducted please contact the local weed scientists that provided this information. There is no record of differences in fitness or competitiveness of these resistant biotypes when compared to that of normal susceptible biotypes. If you have any information pertaining to the fitness of Group B/2 resistant Mayweed Chamomile from Washington please update the database. The Herbicide Resistance Action Committee, The Weed Science Society of America, and weed scientists in Washington have been instrumental in providing you this information. Particular thanks is given to Carol Mallory-Smith, and Alejandro Perez-Jones for providing detailed information.